Canon XH G1 and XH A1, JVC HD1U and similar sized models. TST protection and shock absorbency. Removable Reinforced Aluminium Frame (RAF) for unique viewfinder and microphone circumferential protection. Large main compartment with full length internal side compartment for accessories. Optional set-up customization by using included dividers or Kata's Modi-Vers system. Large external pocket for personal effects or more equipment. Swift 'one pull' double zipper top opening + quick closure buckle. Supplied with Padded Shoulder strap. 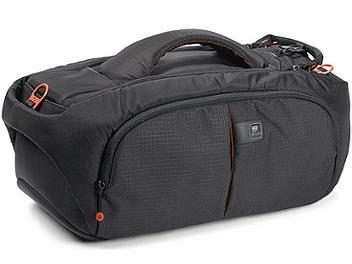 good bag, very light but robust, a bit small though (only if you add a lot of accessories like microphone, deadcat and cable, a few batteries, a torch light...) otherwise it's good !